We might go on indefinitely telling of the development of this community and town. Mr. Haynes did not live to see one of his great wishes materialized. The magnificent school building was built after his death. He always desired to finish up such a building but did not live until it could be done. 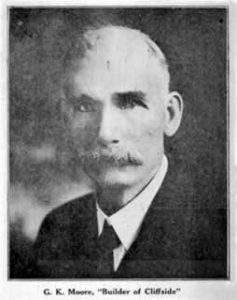 G. K. Moore, the builder of the town, presented his masterpieces in the school building and the R. R. Haynes Memorial Building. They are structures of which he can justly be proud of erecting. No more beautiful buildings can be found anywhere. The Memorial Building was started in 1919. The school building was finished later. Mr. Moore deserves credit not only for the Memorial Hall, but likewise in cooperating with Grover C. Haynes in erecting the quarter of a million dollar school, whose details surpass anything in the state. This school building provides the most improved heating, ventilating and lighting ideas, indoor playgrounds for both boys and girls on rainy days, club rooms for both sexes, ample toilet rooms, is fire-proof, sound-proof and has as its crowning glory a spacious auditorium. The individual desks in the high school rooms are of the automatic adjustable type and cost $13.50 each. Each room is equipped with a Webster unabridged dictionary and a globe atlas. The Indiana limestone columns and trim of the building represent an outlay of $38,000. In fact, it would be hard to calculate the entire cost of this building as it stands equipped today. A chemical laboratory is now being fitted up in the basement for the scientific course.